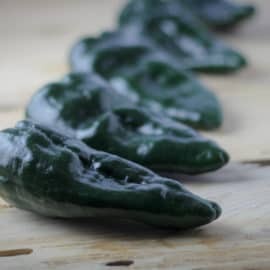 I’ve only been canning for about four years now, but I’ve compiled a list of tips that I’ve found to be very helpful to me as I’ve learned how to can. Never canned before? Don’t be intimidated! Jump right in and give it a try. It’s not as hard as you think! Don’t underestimate the power of a clean kitchen! I often have the tendency to start recipes on the spur of the moment, usually when I have a dozen other things going on at the same time. While this works for some things, I’ve found that impulsiveness and canning do NOT mix for me. Starting a canning process in the middle of a messy kitchen usually results in me forgetting something (running out of lids in the middle of the show is a very bad feeling…) or simply not enjoying the process as much. 3. Allow yourself plenty of time. It’s not a good idea to try to limit the amount of time for your canning. 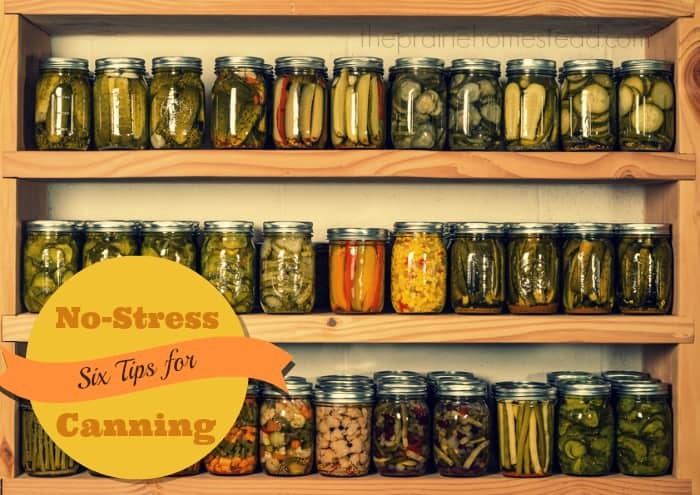 Preserving food always takes longer than I think it will (especially when you have a toddler rummaging through your kitchen and trying to put random items in the toilet…) If you have an appointment at 2:00pm, don’t start your canning at noon and assume you’ll have it all neatly wrapped up by then! When I have a lot of food to process, I like to set aside an entire day for it. Rarely does it take that long, but then you end up with “bonus” time, rather than smashing the canning process into a scant few hours. 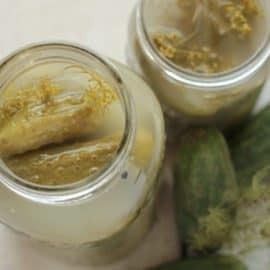 Check out my water bath canning tutorial and pressure canning tutorials if you are new to the whole process. 5. Have a canning party. Preparing and processing large amounts of food sometimes can be a daunting task for one person, so make it fun! Invite over friends to help, it makes the day go faster, and it’s just way more fun. 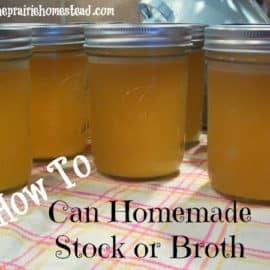 Plus, if you are a newbie, having an experienced canner along for your first time can give you a much needed boost of confidence that you won’t get from merely reading how-to books. If you can for any length of time, you are going to make mistakes. Don’t sweat it! Learn from your mistakes and keep on trying. I’ve had non-sealing jars and pickles that taste like straight vinegar. It just comes with the territory. Though it can seem like a lot of work at times, nothing beats being able to pull a jar of lovely, organic, home-canned food out of your pantry in the dead of winter. I think our grandparents definitely had it figured out! 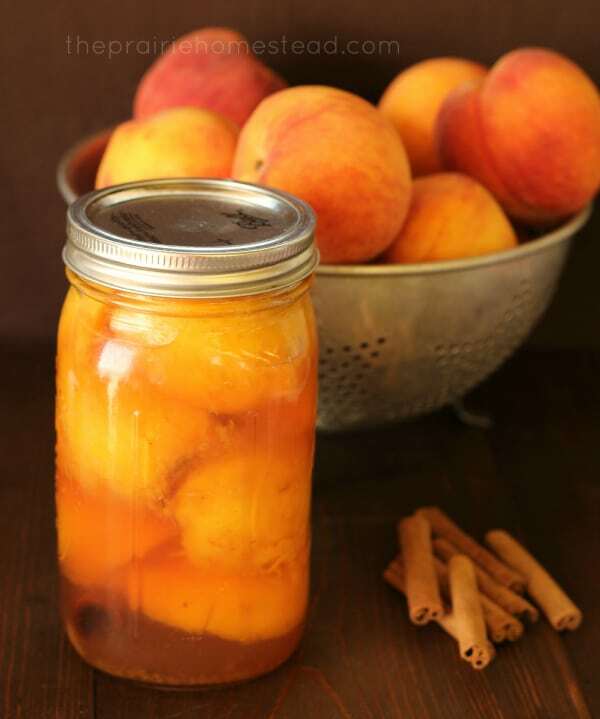 What are YOUR best canning tips? Jill, I love this blog now that I have finally slowed down enough to read it! Your idea on the canning party is especially good and it is how I got canning done when the kiddos were little. We had an annual salsa-making party with about 5 of us–very productive. I made 21 pints of salsa the other day–but no pals to share the time with. Miss those old days! Keep up the great blog. Looks like you are living the dream and it’s a good one! i’d be embarrassed to tell you the mistakes i have made!!! boy you are right- start with a clean kitchen!!! 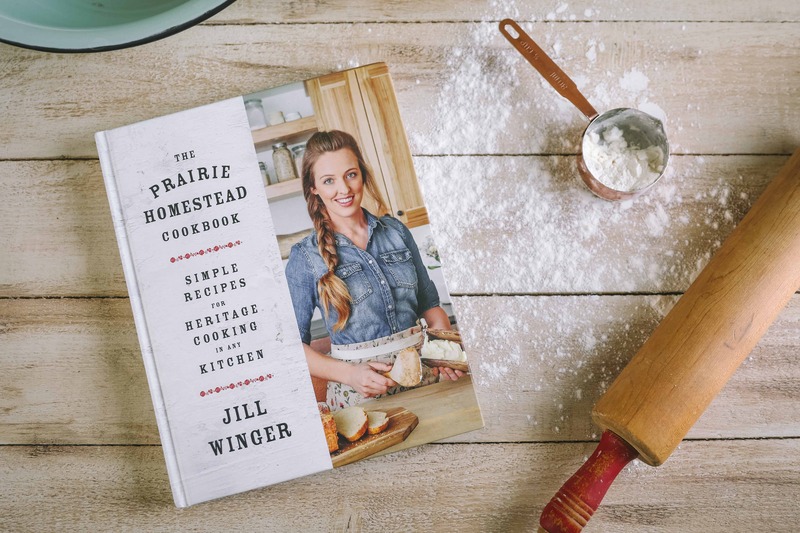 Jill, I love, love, love your statement about recipes being more like “suggestions” rather than rules. How many times I have gotten myself into trouble on that one. Then I tell my family, “okay, I am really going to follow the recipe exactly.” Why am I amazed when the dish comes out perfect when I do that! Haha Marianne, I hear ya! My husband usually just rolls his eyes when he asks “did the recipe say to do that?” and I start listing off my list of changes… hehe. What a timely post! I spent last weekend canning peach jam and dill pickles, but found myself becoming frustrated at times. I hope to try again, soon, and next time I’ll be more organized and relaxed by following your tips! I have linked to your post so that others can be encouraged, too. Thanks so much! Wonderful Brenda! And thanks for the link too! The clean kitchen advice is really critical and soooo easy not to do. I totally agree too — bring in friends. Bulk and scale is everything in canning. We just spent this last weekend canning salsa peach and tomato we did over 100 jars crazy yes but also very satisfying. Great post! Maybe this comes with learning…but know how food reacts. I was SO bummed canning tomato sauce my first time when, what I THOUGHT was a ton of tomatoes, cooked down to only two little pints of sauce. What a waste of time and energy! I would also add, TAKE TIME TO SIT WHEN YOU CAN. 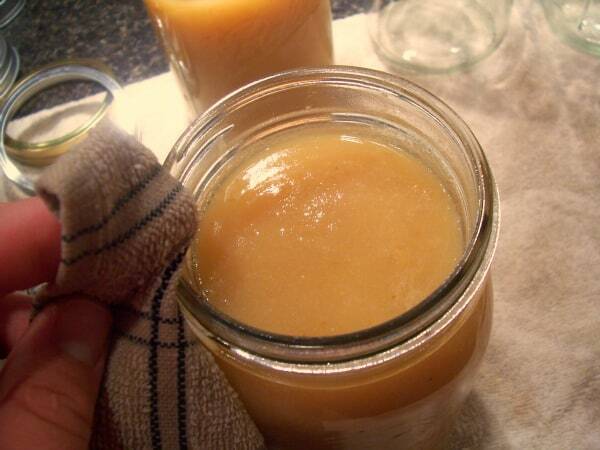 Canning can be an all-day project so sit down over the garbage can to peel, sit down at the table when you screw lids on etc. I’m always so tempted to stand for the whole thing (maybe I think that’ll speed up the work) that I end up with a super sore back. Very good tip, Jill. Yes, I was very dissapointed the first time I canned tomatoes, too. You always think you will get more than you do! And totally agree on sitting down when you can! I only got a few tomatoes until I read a post about pruning the plant. I had forgotten that this year as I have not grown a garden in a while. I pruned the plant and it exploded with fruit!! We have a canning kitchen set up on our covered porch. It has propane double burners, 2 big tables, water, dehydrator, outlets for roasting ovens (I like to use these for roasted tomato sauce), etc. Our canning pantry closet is right there, so we store jars (empty & full) right there and the canning equipment can be stored when not in use. This has been a life saver and the kitchen in the house is still available for regular meals and service. We also can year round; meats, soups, chili, etc. Kristine- I am jealous, jealous, jealous of your canning set-up! That would be ideal, and sounds like you definitely put it to good use! wow how awesome, that is my dream. to have a canning kitchen, with all my preserving things in 1 area and a place to put them up ! that is my goal when we get on our own property (God willing) , to have a canning kitchen and storage for food and a keeping room sort of a second kitchen for all the messy, but fun work, and still be able to use the house kitchen. any tips to incorporate that you have gleaned along the way???? Yes, your tips are spot on! I have had a few times where I thought I had enough lids for my jars, and found out that I didn’t. Or, I didn’t have as much sugar as I thought I had. It’s no fun running to the store at the last minute, even if the store is only 5 minutes away. Great post. I really love the “clean kitchen” part. Especially because mine is rarely clean. 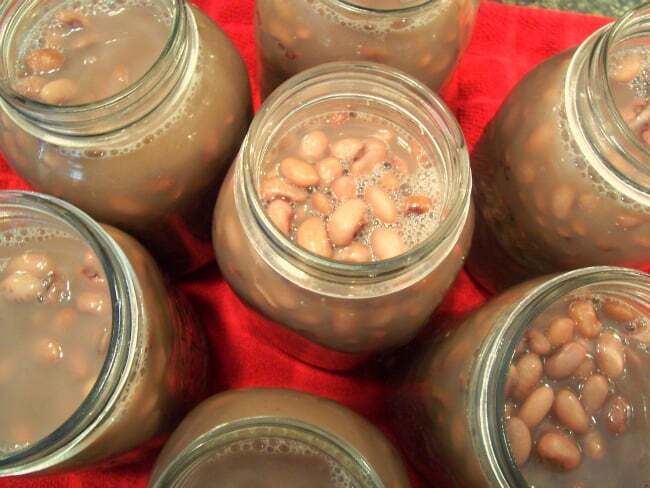 Nice Canning tips, I have been having a good year for canning, aiming for 1200 jars, so far this year, I have put up 968 jars, so getting there 🙂 Still lots coming in from the garden yet. I have never canned meats was wanting to know if I should really be afraid of doing this. I’ve not yet personally canned meat, but plan to in the near future. I’ve talked to several people about it and always get rave reviews about how much they like it. As long as you use a pressure canner to do it, you should be fine! Don’t be afraid to can meat – it’s the easiest thing of all! You don’t have to peel it, pit it or blanch it. It’s the first food I learned to ‘can’ in an old 1946 pressure canner and learned everything else from that point. Still eating meat from 3 years ago and it’s fine! I know that both canning and gardening can be incredibly time consuming. Honestly, when I worked full time outside the home, I didn’t can at that point. I know it can be done, but it probably would take a bit more forethought and organization. 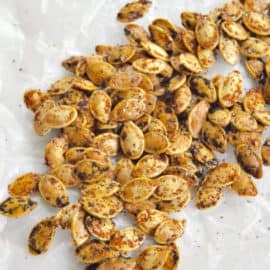 For instance: picking the harvest one evening and preparing supplies, then being all ready when you get home the following night to do the canning process. But, I definitely sympathize with feeling like you are going a million different directions! Canning is a wonderful thing! 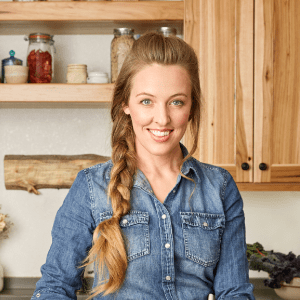 The clean kitchen, and setting up your process…. yes, then it’s “easy”! I love the post! I found this post through Simple Lives. I didn’t tackle canning this year, stuck with freezing and fermenting…but its a vow for next year! I don’t know if this has been covered by previous posts but I thought it’s worth a mention. 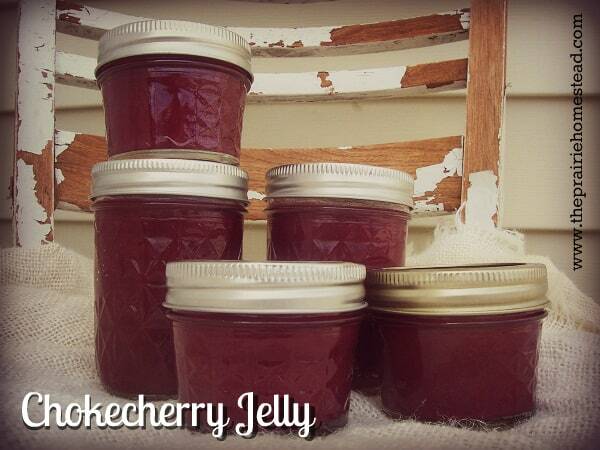 You might also want to consider the wax sealing methods for canning jams and jellies. 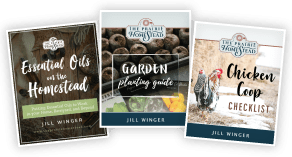 Great blog Jill! You are such an inspiration! I’m new to canning but can’t wait to dive in and can all the goodness we have growing in the garden. I was wondering about jars though.. What would you recommend I’m definitely look for jars with zero chemicals such as bpa or aluminum. I use Ball jars and they are great. Yes, the lids do have a small amount of BPA, but commercially canned goods have much more. And there is also some question over the safety of reusable Tattler lids, so I think that Ball jars with regular disposable lids are the best fit for me. Actually in 2013, Ball discontinued all BPA in their lids. All the new boxes in the stores now should be the BPA free, though there was a transition time where the boxes didn’t necessarily say that. 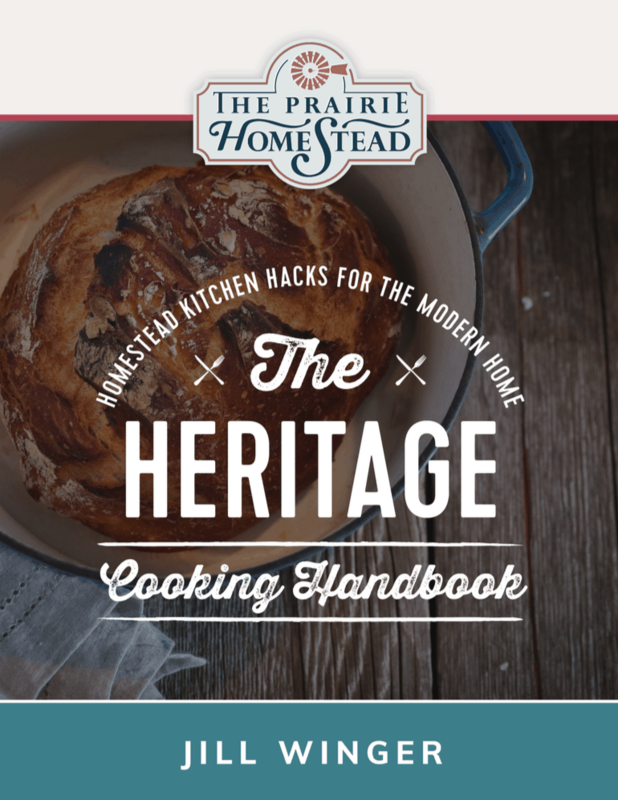 great post, I love canning/ harvest season, thanks for your sharing. If you are worried about having enough for when the stores run out… just buy a lot of lids (and jars – that’s where my husband is right now, looking for more jars since apparently I haven’t emptied enough of the ones I used already!) and store those. i have one more for you…. make enough dinner the night before so you don’t have to cook on a canning day. the last thing i feel like doing after a long canning session is stay in the kitchen cooking, yet again. i always make extra dinner so we can have leftovers, or get something in the slow cooker early in the morning. I just ran across your blog and have a question for you. I canned for the first time last year and canned snaps. All of the jars sealed but my mother came by and said she thinks I left to much head space in the jars. Can that be a problem, allowing something to grow in the jars? And also, some of the snaps have a pink tint to them. I called the county cannery to ask but they had no clue. Someone told me it could be minerals in our water but I am hesitant to feed them to my kids not knowing what caused the discoloration. Any insight you could give me would be appreciated! Thank you! Prepare your equipment before the food would be my tip. I, too, have found myself out of lids! Also, if you are canning all day, put supper in the crockpot or plan a super easy oven meal that won’t interfere with your process. Maybe invest in a gel mat to stand on or wear good sneakers. I started canning about 4 years ago. Unfortunately way before I read this blog. Great advice! I made a lot of mistakes but learned through them all. Now I enjoy it. Love having my homemade sauces by opening a jar of fresh goodness from the garden. Without having to check to make sure I have everything and spending time chopping and cooking on weeknights. Love love love this blog. Thank you for sharing.